Ok, between the flailing, whining, stomping and the kicking of old ladies, not to mention the agonisingly prolonged trip to the police station (because I find that the best way to celebrate your birthday is to lose your wallet), I was unable to post yesterday or this morning, and now have epically little time to update you on the various fascinating goings-on Chez Waffle. I do, however, have a very clear sense of priorities, and thus the most important thing I can possibly offer you today, above all words I might be able to spew forth from my newly addled 35 year old brain, is THIS. THIS, the best birthday present in the world ever, world without end, amen. Brace yourselves for a tidal wave of jealousy. Can you BELIEVE what my brain twin did for me? Well, can you? Thank you M.
I will try and do another quick post with some Salmon palace photo reportage. Possibly. If your retinas can stand it. Oh that is the awesomeness. 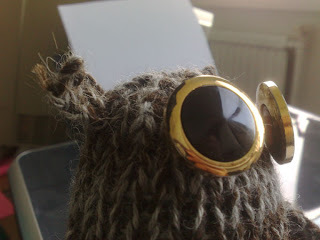 All links to that owl in a box in future should come straight here, end of. That's amazing! You got your owl in a box! AWESOME! 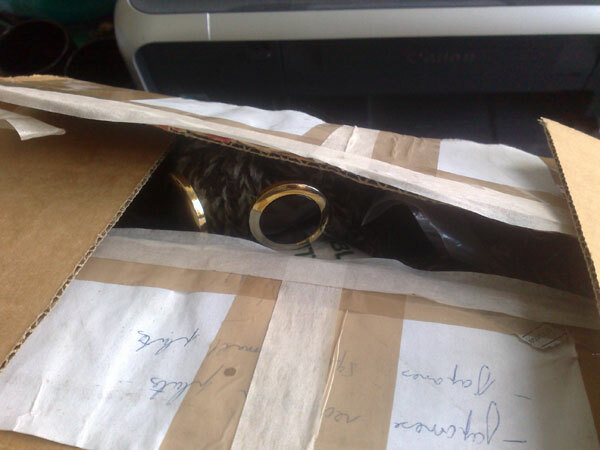 owl in a box = amazing. An instant cheer up! 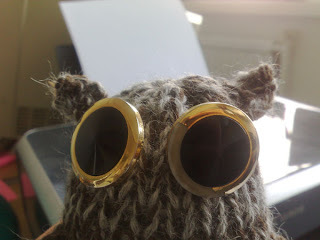 A-maaaazing and oddly reminiscent of Elton John before he had his hair glued back on. That has to take the cake as the best post I´ve seen all day, all week, ALL YEAR. I love him. Due to popular adulation and much appreciated boosting of my ego, Owl in a Box will soon be available on Cruel Tea's etsy store. 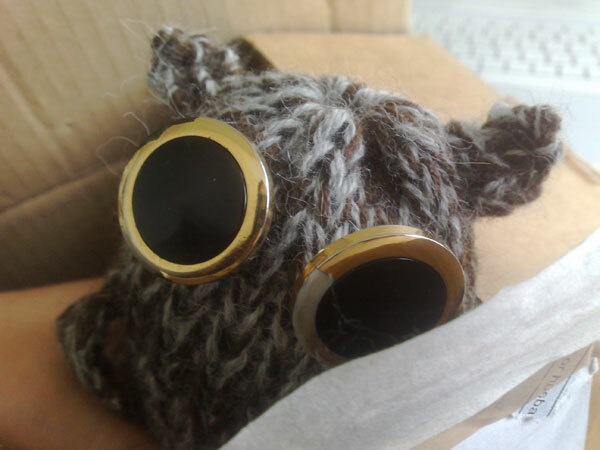 I have sourced vintage buttons. Watch this space. Dammit, my duaghter just saw that and now SHE wants one too. 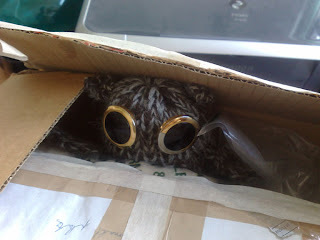 A lovely woolly owl-in-a-box, with buttons for eyes! I'm jealous to the max. 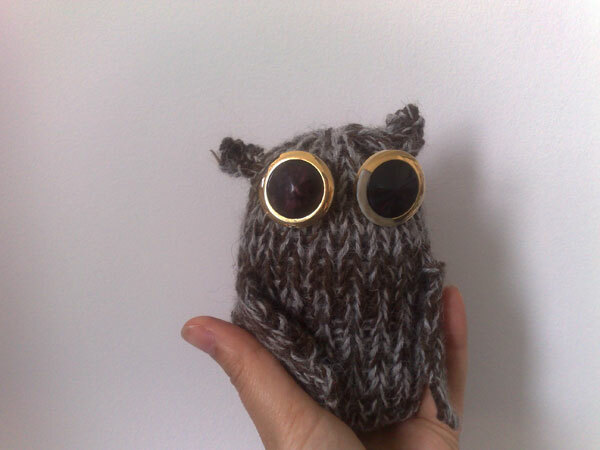 I WANT THAT FOR *MY* BIRTHDAY. He is the bestest! gorgeous. i want to eat it. or lick it. or kiss it. or something extreme. I have to say, I LOVE THAT. 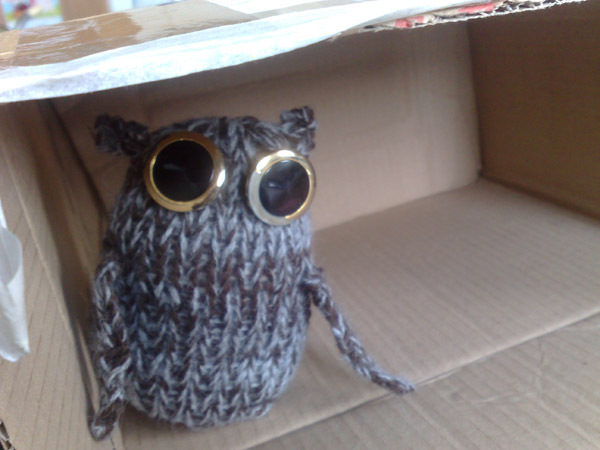 You really can't go wrong with a woolly owl in a box. Or anywhere really. In fact, they should be mandatory at every special occasion. I want an owl in a box. I really REALLY do. 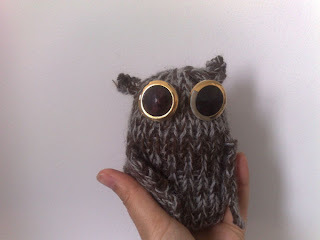 Luckily, I have a lovely twitter friend who tells me she can make one for ME!!! I am happy.